Michael and Jean-Marie were guest speakers at the Empire Breakfast Club on Friday January 30, 2009 at the Fountaingrove Inn in Santa Rosa, California. The Empire Breakfast Club is a men’s social club that has been in existence since the mid-70s, and consists of about 30 to 40 members of the professional business community. 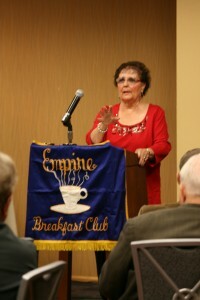 Jean-Marie speaking to the Empire Breakfast Club members. 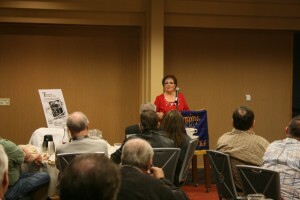 Close-up of Jean-Marie speaking about her experiences in Santo Tomas. Jean-Marie, Jim Johnson, and Michael. 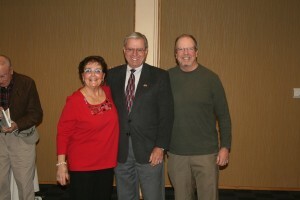 Jim Johnson is the program chair of the Empire Breakfast Club, and a broadcast legend in the San Francisco Bay Area. Jim is also the president and owner of Jim Johnson’s Turning Point, an insurance and investment brokerage firm in Santa Rosa.